Bottle 50cl. @home poured into a lager glass. Clear pale amber, tall frothy off-white head, good retention, fair lacing; aroma toasted malts, light caramel, grass; smooth taste, medium sweet and light bitter, malty, caramel, spicy notes; sweetbitter aftertaste; medium body, oily texture, soft carbonation; nice clean Märzen. Clear deep golden colour with a big foamy white head. Lot of maltiness, some sweetness, pencil, woody dryness and a hint of fruitiness. Bright golden color with a lasting white thick head. Aroma is grainy and malty with some straw notes. Flavor is roughly sweet with a sticky bitterness at the end. Strong body with an average carbonation. Clear deep golden color, small white head. Sweet malty, even a bit metallic aroma. Medium-bodied. Malty, light bitterness in the finish with some metallic notes. Quite dry malty festbier, usually these are sweetier and as such this is perhaps closer to Helles style. 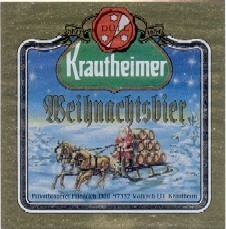 Despite of metallic notes, it is a clean beer to have with XMas food. For sessions a bit lame. Ins Glas ergießt sich ein dunkel-goldgelbes Bier mit geringer Schaumkrone. Geruch malzig würzig, Geschmack angenehm malzig würzig mit ganz minimaler Bitterkeit.